Made of durable oxford fabric and polyester printed lining, durable and fashionable. Thicken breathable strap and back design, comfortable to carry. A detachable shoulder strap can easily turn the backpack into a shoulder bag/crossbody bag. 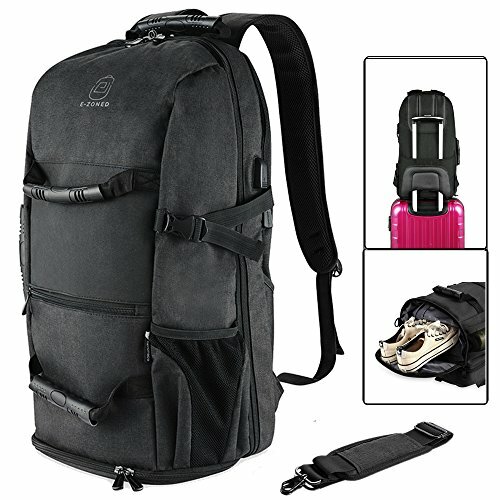 This duffel backpack is good for outdoor, business working, traveling, hiking, camping, school, college, commute and everyday using. This backpack suitable for standard 17.3 laptop dimension: 16.3"x10.6"x1.2"/41.5x27x3.12cm, not for larger dimension laptop. It can fit under the seat on a plane as a carry on. This travel backpack is made of durable 300D water-repellent oxford fabric and polyester printed lining. The adjustable shoulder straps and back side with EPE cotton padding to comfort your shoulder, breathable and anti sweat. Smooth zipper and metal puller which makes it move easily. This business backpack (come with a shoulder strap) can be used as shoulder backpack, shoulder bag, handbag, crossbody bag. The 4 plastic handle design can be anti-sweat anti-slip.